1) To cushion, absorb or control energy to external load : Car springs, Railway buffers 2) To store Energy : Watches Toys 3) To Measure forces : Spring Balances, Gauges ,Engines 4) To provide clamping force in Jigs & fixtures. 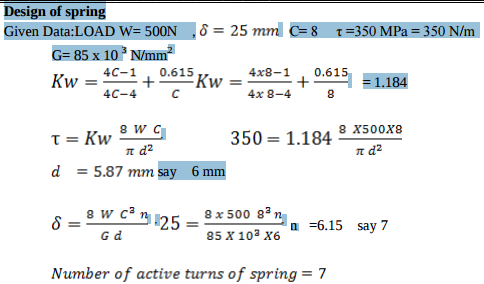 5) To apply forces as in brakes, clutches & spring loaded valve. A railway wagon having 1500 kg mass and moving at 1 m/s velocity dashes against a bumper consisting of two helical springs of spring index 6. The springs, which get compressed by 150 mm while resisting a dash made of spring steel having allowable shear stress of 360 N/mm2 and modulus of rigidity 8.4  104 N/mm2 . Design the helical coil spring with circular crosssection of spring wire. 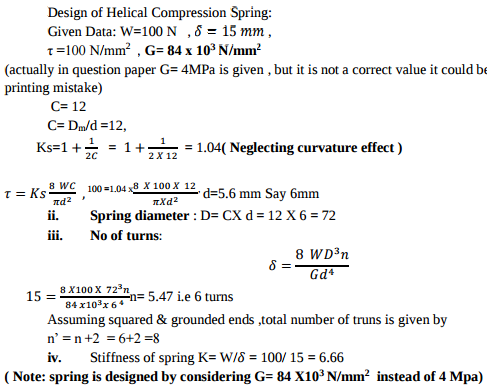 Design a helical compression spring with ground ends. The spring index is 12. Maximum load on the spring is 100N and deflection under maximum load is 15 mm. Allowable shear stress of the material is 100 MPa and modulus of rigidity is 4 MPa. 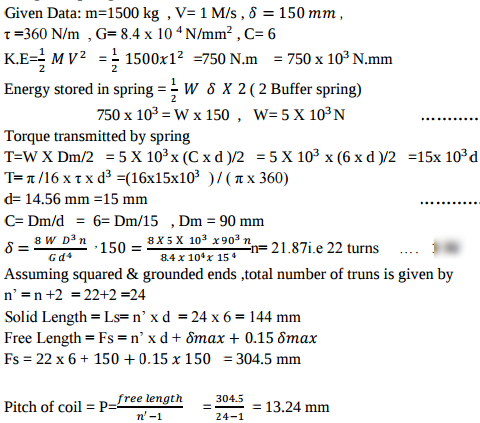 Find wire and spring diameters, number of coils and stiffness of spring. A safety valve of 60 mm diameter is to blow off at a pressure of 1.2 N/mm2. It is held on its seat by a close coiled helical spring. The maximum lift of the valve is 10 mm. 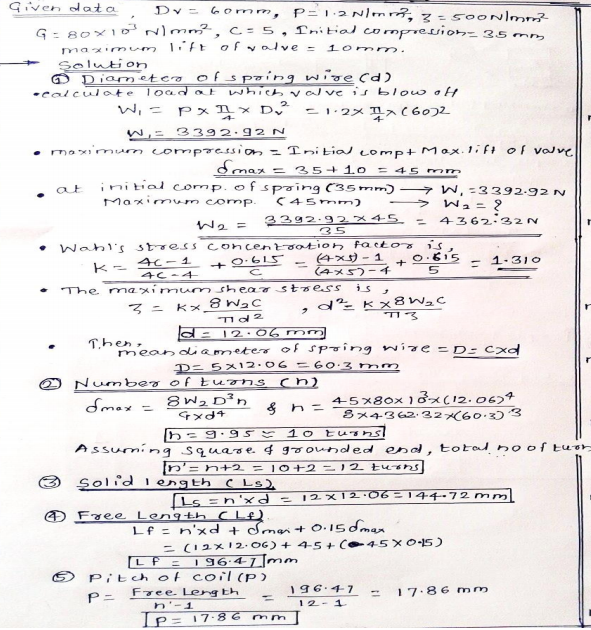 Design a suitable compression spring of spring index 5 with an initial compression of 35 mm. The shear stress for spring material is limited to 500 MPa. Take G = 80 kN/mm2. A semi-elliptical carriage spring of 1200 mm length withstands a load of 60 kN with maximum deflection of 90 mm. Assume breadth to thickness ratio as 8. 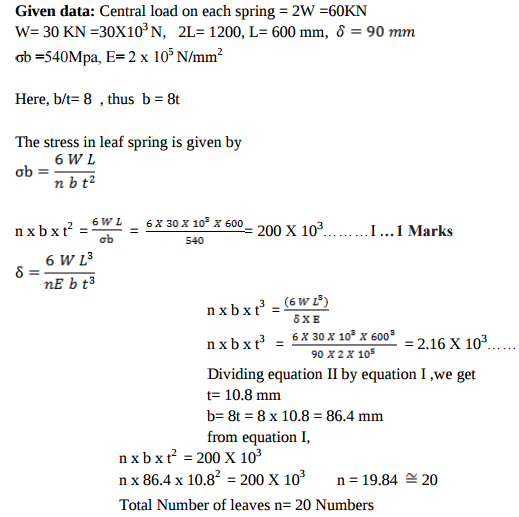 Design the spring if bending stress of spring material is 540 MPa and E = 2 × 105 N/mm2.